Unsafe Driving Can Cost You $ Millions! Use GPS fleet management to catch and eliminate unsafe driving practices! Did you know that according to the FMCSA, the average fleet vehicle accident costs organizations $22,000. If there is an injury, this cost goes up to $331,000 and if there is a fatality, it increases further to $7.2 million! In fact, accident-related costs are one of the leading causes for small business failures throughout the US. 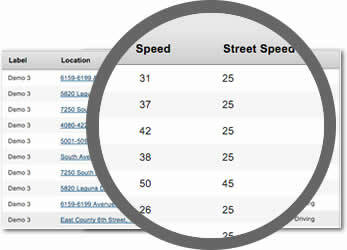 We monitor aggressive driving, posted speed limit violations, and max speed violations. Our alerts give you the ability to stay on top of these harmful driving habits and eliminate them before they cost you money! Ensure that they aren’t using your fleet vehicles after work hours by setting up alerting rules for personal use. This ensures that they aren’t increasing your exposure by driving home from a bar or taking their kids to soccer practices in your fleet vehicle. Proper driver activity monitoring will reduce your risk by eliminating unsafe driving behaviors! Contact us today to learn more about how FieldLogix can help you improve your fleet safety!